What is 'smart / casual' dressing anyway? Do you hate the term 'smart / casual'? Do you know how to wear 'smart / casual'? There are many dates in our diary, days of the week or events in our life where the term 'smart / casual' is applicable. Getting your outfit right for the occasion is something alot of you struggle with as it's normally top of the list for most of my clients. Whether it be for going to work everyday in an office environment, a Christening, a dinner date or meeting, or you just want to change up your style for everyday, 'smart / casual' dressing just got a whole lot easier. For the past couple of seasons trends have been shifting so that more casual attire has become smarter. The new rules are now the old rules, because creativity rules! Street style watchers will know suiting is firmly back on the fashion agenda for spring, but that doesn’t mean the same old black blazer and fitted pants. Suits have become brighter, checked or pinstripe and matching. That's not to say that the humble blazer doesn't play a part, this piece is an important part of your wardrobe and no doubt I will be buying more than one this season to change up every outfit that I wear. A simple dress and opaque tights just won't cut it anymore, style a spotty midi dress with this season's must-have jacket the trench, belt at the waist and the soft fabric means it's no longer smart and structured but more relaxed and understated. It's no longer about black, white and navy, liven up your work-wear or smarten up your day look with some eye catching colour. Red and pink are current favourites to give your outfit some serious colour clash, but blues and greens can be easier and softer on the eye if you don't want to stand out from the crowd too much. Lastly take the plunge and grab a jumpsuit and take away the worry about what goes with what. I feel it is my job on this earth to persuade any remaining resisters as to the power of the jumpsuit. Jumpsuits are a versatile all-rounder, whilst being the most youth-endowing item of clothing you can wear as you get older. Want to look both stylish and cool for day or evening then a jumpsuit should be your go-to wardrobe staple. What better way to forget about the cold outside and welcome the in a new week with some new 'smart / casual' pieces for your wardrobe. 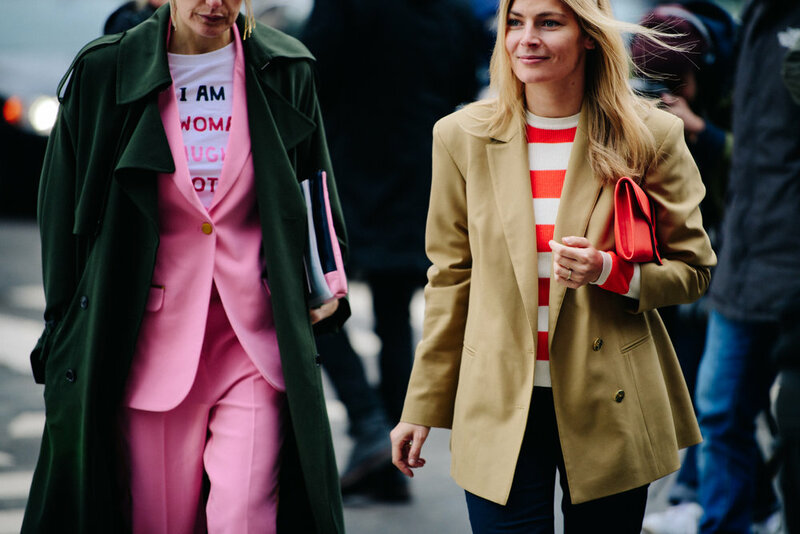 French connection has an amazing bright pink suit you might be bold enough to try, alternatively if you are looking for a new suit but would rather a check then look at &other stories check suits. For a great choice in blazers then go to &other stories for lots of oversized, longer line grey, check or navy stripe blazers for a fresh new season take on the silhouette. My favourite trench coat I have come by so far is from Kin by John Lewis in navy or khaki, but if you are looking for a stone one then you can't go wrong with this one from Selected Femme. For a great choice of cropped trousers then head over to Zara, they have them in every fabric, cut, colour you can think of and you will be sure to find one that flatters you. Finally if you fancy some floral midi dresses, most high street retailer have an offering, but try Topshop for bright coloured printed dresses and vintage inspired florals that are easy to wear with any jacket styled over the top.